Image credit Gerard Stolk via Flickr. I am probably one of the few people of color who, as a child, was not offended by the Dutch (and Belgian) character, Zwarte Piet (or Black Pete), celebrated every year on December 5th. Zwarte Piet is of course the “helper” to Saint Nicolaas (or Sinterklaas), the patron saint of children. The “folklore” around Sinterklaas is aimed at teaching children moral lessons. The role of executioner and punisher falls on Black Pete. The latter is a blackface character. Basically, a lot of white Dutch people dress up as Zwarte Piet in blackface and see no problem with it. Growing up, I never related Zwarte Pieten to people of color. For me, Black Pete was an object, an alien, and not a human being. And while I was also raised in a predominantly white environment, I was never exposed to negative conditioning regarding the African, specifically Acholi, part of my heritage. My naivety, as some may call it, reminds me of a letter written by Bayard Rustin, the American civil rights leader, to one Charles McCracken, a resident of Los Angeles, in 1951 about the harm caused by Minstrel shows. Rustin argues that social practices are far more influential in the development of children’s moral character then are moral lessons taught by parents, teachers and others. If people see black people in inferior positions, whatever adults close to them may tell them otherwise, they associate blacks with inferior work and positions in society. If black people were completely accepted in the social, political and economic life of the United States, then, Rustin argues, he would not have to be offended by a Minstrel Show. The opposite is true, so it makes sense to be opposed to forms of entertainment that do harm, that hurt other people, and that create social division. I encountered my fair share of open racism in my formative years in Berlin in the 1980s. Germany’s history of racism and fascism is well documented, so is its xenophobia. Between 1990 and 2010 more than 149 people were murdered in racist violence there. Although I learned about racism in Germany, I was not exposed to caricature such as Black Pete until we moved to the Netherlands in 1992. Every year—from mid-November through the 5th of December—Sinterklaas (who resembles Father Christmas, but in 16th century noblemen’s costume) and Black Pete, would be everywhere: on television, posters, in music and other merchandise. Luckily in my progressive primary school, Dr. E. Boekmanschool, Black Pete was not a being of dark skin: instead he was made out the primary colors found in a cheap drugstore makeup palette. The philosophy of Dr. E. Boekmanschool is based on awareness, mutual respect, independence and creativity. The school board, in partnership with the parent body, introduced a number of revisions in how students at the school would celebrate Sinterklaas and how Black Pete would be portrayed. The emphasis was on respect and inclusivity. In 2010, long after I had graduated from the Dr. E. Boekmanschool, I was living in Kampala, Uganda. A Dutch friend asked me to join in the Saint Nikolaas celebration at the Embassy of the Netherlands along with a couple Black Petes. I did not participate in the event, but it was at that moment I realized the cognitive dissonance and of the ignorance of modern colonialism within the Dutch culture. It made me question my role within a marginalized community. It is that time of the year again and like most social media users in the Netherlands or with Dutch connections, my newsfeed is full of articles related to the debate around Black Pete. Many comments are derogatory towards foreigners and/or brimming with “pride” for Dutch culture and for Black Pete. That said, in recent years there has been some progress to rid the festival of its racism, including smaller, inclusive initiatives, such as De nieuwe Sint, but these are uncommon outside urban areas of the country. The movement “Zwarte Piet is Racisme” (Black Pete is Racism) and the reactionary backlash against it revealed another side of the Netherlands. 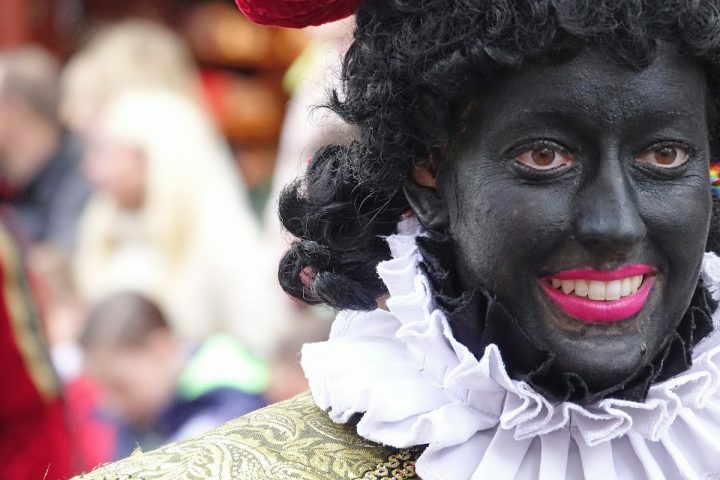 Denial, racism and disrespect are at the core of arguments defending the holiday festival and its racist charicature—from ordinary Dutch citizens to the country’s Prime Minister—“This is a tradition”’; “it is a children’s holiday”; “Black Pete is black because of the chimney.” Any attempts to dismantle the “tradition” are seen as irreverant and undermining Dutch culture. Has Africa’s May ’68 been forgotten?